We are a protected people. We have been given the “full armor of God” (Eph. 6:10). Let’s put it on. I looked around. It was a beautiful fall day. Warm sunlight illuminated everything, and a soft breeze moved along, keeping things comfortably cool. Strangers passed each other on the street with friendly nods and gestures. I’d just gotten back from a local contractor spontaneously giving me a tour of a new building in town. He turned out to be a high school friend I hadn’t seen in years. The academy students were now all out on the playground. I saw a group run, collide, fall down, help each other up, laugh, hug, and go on playing. The dialogue quickly led to the plethora of negative information we are regularly fed via media and technology. People feel like everything is negative, bad things are happening everywhere, or worse, might happen at any time. A sense of fear and insecurity grips our society. Someone once said that life is lived amidst two spheres of knowledge and experience: one sphere is comprised of the things we are aware of and can influence directly; the other of things we are aware of but that are out of our control. The difference in size between those two spheres is the cause of stress and anxiety. 1. You are baptized, chrismated, go to confession, and partake regularly of the Holy Eucharist. Because of this, evil is held at bay. Unlike those outside the Church, you are not so susceptible to the influences of “the rulers, the authorities, the world rulers of this darkness, the spiritual forces of evil in the heavenly realms” ” (Eph. 6:12). You are not of the world but called out of the world to wage victorious warfare against these powers. This assumes a position of strength, not weakness. 2. This is God’s world, and we better not forget it. He made it, it belongs to Him, and He is guiding history and events for the salvation of all. It is our song that rings, “Our God is in the heavens and on the earth, He does whatever He wills.” It is our God who said, “In the world you will have tribulation, but be of good cheer [take courage], I have overcome the world” (Jn. 16:33). It is our God who desires to gather us “as a hen gathers her chicks under her wings” (Mt. 23:37). 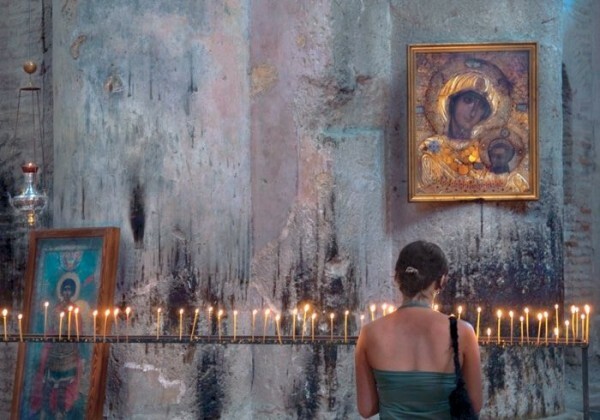 It is our God who said, “I will build My church, and the gates of hades will not overpower it” (Mt. 16:18). That means hades is being attacked by us! 3. Cry out to God and the saints! Be bold! Take those desires for God’s help out of your head and get them going out of your mouth: “Lord help me, darn it! Strip away the fear and give me boldness. Empower me to see the grace of the Sacraments of which I partake. Drive the cloud of circular thinking off my head and teach me peace. O Lord, I believe, help my unbelief!” Don’t just think these things; shout them out. When under the threat of a barbarian invasion, the faithful of Constantinople gathered in church to call on God for help. 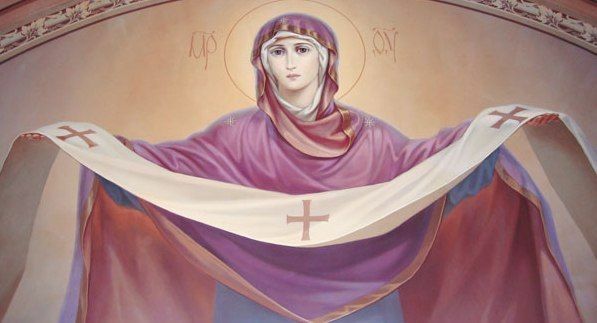 As a result of this faithful action on their part, the Mother of God appeared over them, spreading her protecting veil over them (as she is always doing), and the danger was averted. We are a protected people. We have been given the “full armor of God” (Eph. 6:10). Let’s put it on. Encourage each other with simple words: “It’s going to be okay”. There is nothing intimidating about a battle when we’ve got the best armor, we are going to win, and we’ve learned to enjoy the fight.